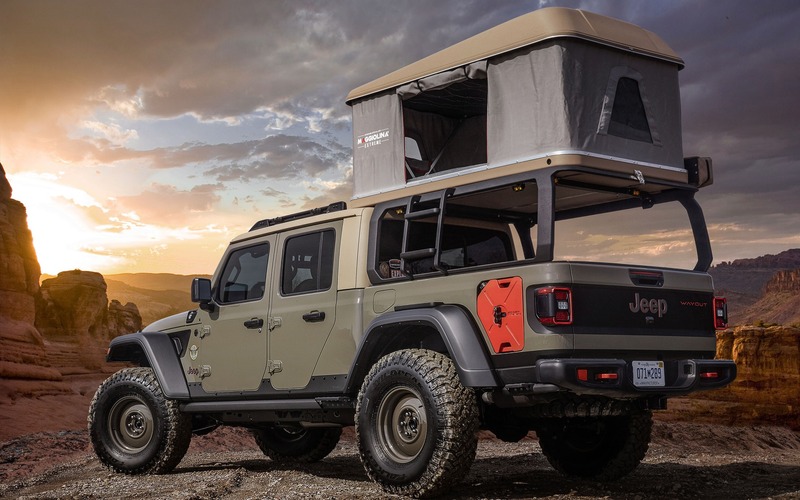 FCA has just revealed the six awesome concept vehicles that will be on display at the 2019 Easter Jeep Safari in Moab, Utah, from April 13-21. Unsurprisingly, all of them are based on the brand-new 2020 Jeep Gladiator pickup, which we tested earlier this month. They should have no trouble catching the attention of the thousands of off-road enthusiasts on hand with their wide array of production and prototype Jeep Performance Parts, as evidenced by our photo gallery above. “Customization is one of the highest priorities for Jeep brand enthusiasts. This is why we have proactively developed a portfolio of more than 200 exclusive parts and accessories for the all-new Jeep Gladiator,” said Steve Beahm, Head of Parts and Service (Mopar) and Passenger Car Brands, FCA - North America. Loud and rowdy, the Flatbill mainly targets dirt-bike enthusiasts. With the removal of the tailgate, dedicated wheel ramps have been installed that slide out for easy access and loading. Custom body work on the lower bed panels and the addition of a tube rear bumper increase the vehicle’s departure angle for added capability. Dynatrac Pro-Rock 60 front and rear axles, plus an Off-Road Evolution custom four-inch lift kit, help the Flatbill tackle any obstacle. The 20-inch wheels are wrapped in 40-inch tires—the first time on any Jeep Gladiator—and sit under high-clearance flares. Last but not least is a cold-air Mopar intake for Jeep’s 3.6-litre V6. Painted in a new Gator Green colour that will be available on production Gladiator models, this retro-looking concept harks back to the original Willys pickups. Designed for modern adventurers, the Wayout showcases a full roof-top tent and a large, 270-degree awning with amber LED. These go along with an integrated roof-rack system. Meanwhile, a bed-drawer system offers added lockable dry storage and two auxiliary fuel tanks are custom-fitted into the bedsides. A two-inch lift kit, a 12,000-lb. Warn winch and a Jeep Performance Parts snorkel provide extra capability. Continuing the “Resto-Mods” theme, the M-715 Five-Quarter (a nod to Jeep trucks of the past that were one-and-one-quarter tons or “five quarters”) is inspired by a 1968 model. A full carbon-fibre front end replaces the original sheet metal, while an all-new, bobbed six-foot aluminum bed with perforated panels highlight the back. The brushed metal finish contributes to a polished look. A 3.5-inch lower convertible soft top combines with massive 40-inch tires for a monster truck stance and silhouette. This concept has the heart of a monster, too, namely FCA’s 6.2-litre supercharged HEMI V8 that produces more than 700 horsepower. Here, a Gladiator Rubicon was customized in a two-door configuration to maximize cargo space with a six-foot bed that is 12 inches longer than the standard Gladiator bed. The custom Metallic Brilliant Blue paint is an homage to the exterior look of the 1978 Jeep Honcho. 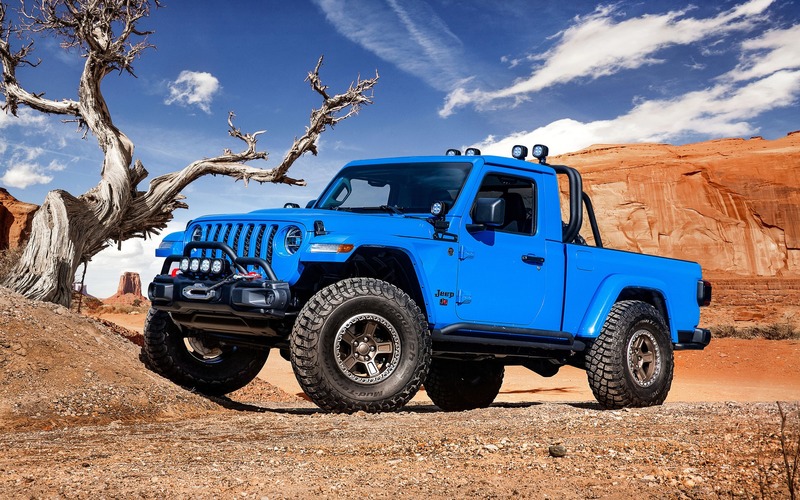 Additional modifications defend the J6 against off-road obstacles, including a two-inch lift kit, a prototype two-inch steel stinger bar that bolts to the Rubicon front bumper and rock rails customized with two-inch steel tubes welded to the standard Jeep Gladiator rails. A total of 10 five-inch Jeep Performance Parts extra-bright LED lights work together to illuminate the trail. This other concept carries the throwback colour palette and graphics of the iconic CJ Scrambler from the early 1980s mixed with a combination of available Jeep Performance Parts. The body-coloured two-inch steel prototype tube sport/roll bar anchors to the bed and also extends the length of the bed rails on each side, offering a total of eight tie-down points to lock down cargo. LED lights were added in various places here as well. Performance from the 3.6-litre engine is enhanced with a Mopar cold-air intake and cat-back exhaust. The Gravity concept’s bed combines Mopar cross rails with a cargo carrier basket to deliver storage space for rock-climbing gear. Two-inch round steel tube doors and tie-down straps that secure the windshield when lowered help provide a greater sense of open air. Riding on 35-inch tires and a two-inch raised suspension, the vehicle is upgraded with a cold-air intake and cat-back exhaust system to increase horsepower and torque. Oh, and did you catch the vivid Punk’N Metallic Orange paint? On a final note, most of these Jeep Gladiator concepts are dressed up inside with Katzkin leather seats.